Do you have a tween girl? I do, and one of her favorite creatures is a unicorn. Most days she leaves the house wearing at least one thing with unicorns on it. She loves anything with unicorns — clothes, stuffed animals, stickers, and definitely food like these Rainbow Unicorn Cupcakes. If a food has “unicorn” in the name, my daughter is definitely going to eat it. Does anyone live in the Dallas / Ft Worth area? I’ve heard there is a Unicorn cafe somewhere near Reunion Tower in Downtown Dallas. I think she would be in absolute heaven if we visited, but we haven’t had the time. This just might be the perfect birthday surprise! Her birthday is coming up in just a few weeks. 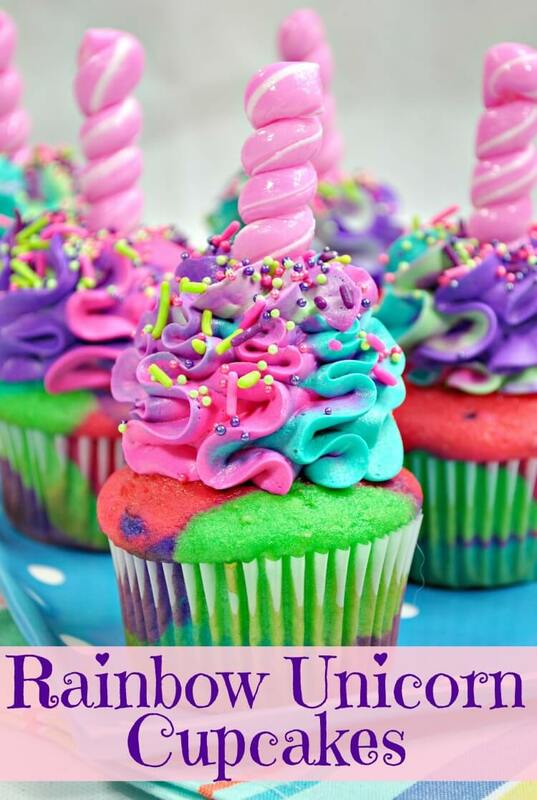 These Rainbow Unicorn Cupcakes are just the perfect treat for her and all the other little unicorn fans out there. These are the quintessential cupcakes for any little girl’s birthday party. Who doesn’t get a little excited about unicorns? They have a few steps due to the rainbow aspect of them, but they are so worth it! 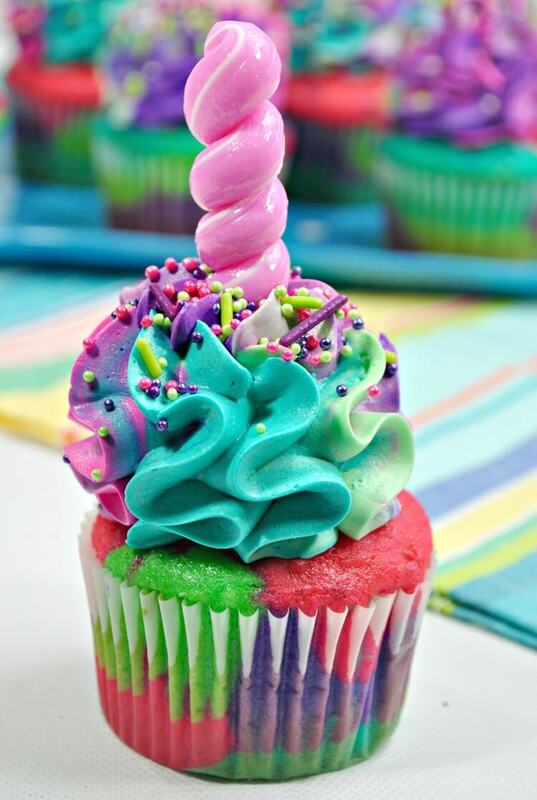 When you layer the cupcake batter, make sure to do it gently so not to mix the colors. It actually is not that difficult to do. I always get a little stressed it’s all going to mix together and turn some yucky brown color, but so far I’ve always had good luck with unicorn rainbow foods. 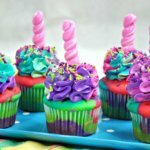 When your little girl has her next birthday party, these Rainbow Unicorn Cupcakes would make the perfect celebratory treat! In a medium bowl, add the cake mix, butter, milk, and vanilla extract and beat for 2 minutes on medium speed. Divide the batter into 4 bowls and add a food color gel into each bowl. Add the Teal to one bowl. Add the Purple food coloring to the second bowl. Add the Pink food coloring to the third bowl. Add the Leaf Green food coloring to the fourth bowl. 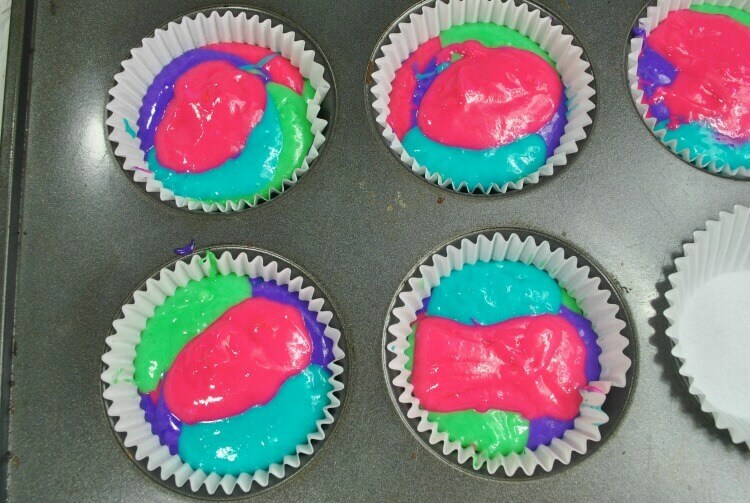 Begin to fill the cupcake liners with about 1 tablespoon of each colored batter into the cupcake continue to rotate colors until it is 3/4 of the way full. Pull out the cupcakes and allow to cool completely before frosting. Using an electric mixer and beat the butter until fluffy. Add the powdered sugar 1 cup at a time and 1 tablespoon of whipping cream at a time and continue beating. Mix until you see stiff peaks forming in the frosting. If it seems a little dry, add the additional whipping cream. Once the frosting is made, split it into 4 bowls. Mix each color until well combined. Place the piping bag with a big star tip into a large glass and fold the sides of the bag over. Scoop one spoonful of the Teal frosting onto one side of piping bag. Scoop one spoonful of the leaf green frosting onto the last side and squeeze the icing together. Sprinkle a little bit of the unicorn sprinkles onto the top of the cupcakes. Place a lollipop into the center of the cupcakes. Let’s make it a unicorn party! 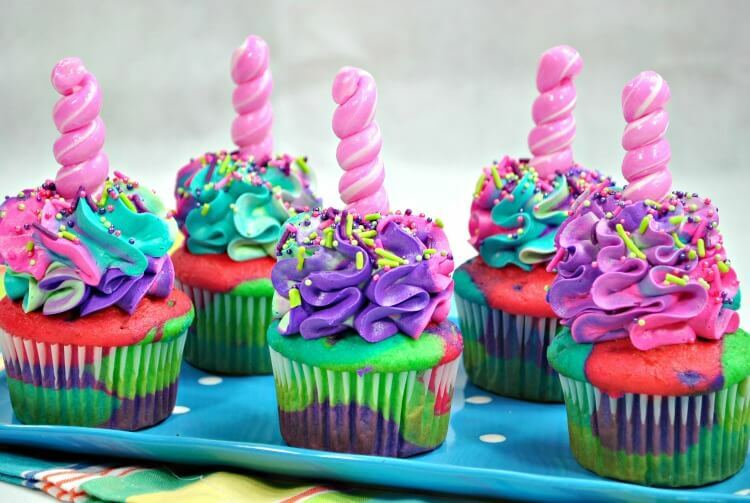 Here are a few more unicorn food recipes that we love that you don’t want to miss! 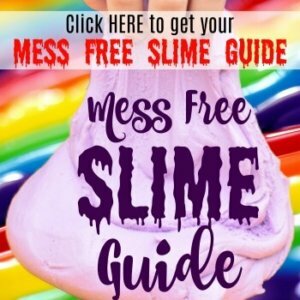 Do you love to make Fun Kids Food recipes? 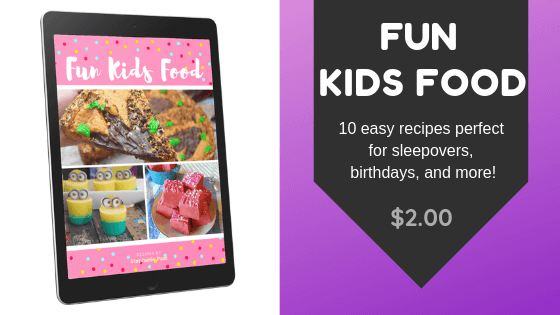 Click below and grab our eBook full of recipes that are totally fun for kids to eat and help you make!